Forests are the lungs of the earth. Almost all of us heard this phrase in some context. However, have you ever thought, for example, while walking in a park or forest, what is the real role of forests in our life? Yes, many of us remember from their schooldays that trees absorb carbon dioxide and produce oxygen that humans breathe. We can go even further and firmly state that the forests play a key role in our battle against climate change, taking into consideration that carbon dioxide is one of the most important contributing factors of the “greenhouse effect”, which is resulting in the global warming. At the same time, it’s not widely known that approximately 60 million people in the world, largely indigenous peoples, reside in forests, and for these people the forest is their home, shelter and livelihood. Moreover, 1.6 billion other people depend on forests for their livelihoods. Large forests and forest complexes are crucially important for water supply of nearly half of the world’s largest cities from Caracas to New York. In many developing countries, 80 per cent of energy consumed for domestic and industrial purposes is of the forest origin. Yet, despite all these benefits, global deforestation continues at an alarming rate - 13 million hectares of forests are destroyed annually, equal to the size of Greece or Nicaragua. And the only cause of it is the human activity, no matter whether it is carelessness, rush for immediate profit or a simple desire to survive. Deforestation and forest degradation is of extreme concern among the specialists of the United Nations Environment Program (UNEP). In a recently published document “ Forests and People” by the UNEP is asserted that deforestation may begin… from our plates, to be more precise, from the meat we eat. While cereals and cash crops, such as coffee and cocoa, have expanded, so has livestock farming, boosted by an increased demand for meat products. In the last 20 years only the pastureland territories have doubled and may double again by 2050. Of course it is good news that under­ or poorly nourished populations should have access to richer food, but this can have harmful side effects. Livestock farming requires large surface areas: of all human activities, it takes up the most land. Pastureland occupies 26 percent of the earth’s landmass, while forage production takes up about one third of arable land, and these areas continue to be expanded, mostly by the way of deforestation. The most dramatic situation is in the Amazonian rainforests, situated on the territories of nine countries - Brazil, Peru, Colombia, Venezuela, Ecuador, Bolivia, Guyana, Surinam and French Guiana. About 80 percent of the endangered forests are being cut in these countries for soybeans and other crops used to feed livestock. For those who already eat meat several times a week, cutting back is an easy and effective way to protect the planet. If you don’t want to cut back on meat, then consider specially certified meat, which takes environmental and animal welfare concerns into account, or switch from beef to less polluting meats such as poultry, taking into consideration that seven kilos of soybeans or maize are needed to produce one kilo of beef, compared to only two kilos for chicken. Helping the environment is also about helping yourself. Excessive meat consumption leads to numerous health problems, including obesity, cancer and cardiovascular disease. The other problem is forest fires. On average, 350 million hectares of vegetation burn each year throughout the world, representing 1% of forestland. In Russia and some European countries we see the same spectacular images year after year: raging wildfires, firefighters, water bombers and houses in danger of being engulfed by the flames. Sometimes there is a human toll too. Forest fires are part of a natural, age-old cycle and can play a positive role for the ecosystem in enabling it to rejuvenate itself. The Mediterranean forest ecosystem, for example, has evolved with fire: some plants such as pines require the heat of an ire to open their cones and release the seeds into the air. And the cork oak is able to survive most fires thanks to its bark. In denser forests, fires create clearings that enable different species to flourish. However, the alarming factor is that more than 90 per cent of all fires are started by humans. Abandoned campfires, unextinguished cigarette butts or simple carelessness, in combination with the extreme heat and lack of rains have resulted in 2010 in the destruction of huge forest areas in Russia - from 1.5 to 6 million hectares according to various sources. Emergencies of this kind not only result in a direct harm for the environment, but also can have far-reaching consequences. Forest fires produce large quantities of green­house gases, contributing to climate change. This in turn increases the risk of more forest fires at more frequent intervals. Another problem, typical for the developing countries, is the use of wood as a source of energy for domestic and industrial purposes. Many people don’t even think about the role of forest in their life, until they realize that the source of their livelihood that was used for housing, cooking and heating, no longer exists. Forest cutting for industrial purposes also results in irreversible damage for the environment, if it is done recklessly and not controlled by strict regulations. The annual world turnover in the forest and related industries is estimated at 330 billion US dollars, and it is pitty that most companies don’t take into consideration the fact that the processed wood must be compensated so the future generations could breathe. In the UNEP, the term “incidental deforestation” is used for the situation when forests are cut down simply because they bar the way to underground resources. For example, in the Appalachian Mountains in the United States, mountain top removal coal mining uses explosives to destroy large areas of the forests that cover the summits. Often, an area of land that has been destroyed for this reason is totally abandoned after the mineral resources have been mined. Sometimes it is restored by the operating company, but this is rarely the case. The unauthorized logging of precious wood is one more threat for tropical forests, which are home to tens of thousands of tree species. For example, the various species of mahogany, ebony, rosewood and merbau are consequently widely exploited all over the world: they are used to make furniture, decorative objects and musical instruments. But their exploitation endangers not just the species themselves, but the whole forest. To access a single tree, loggers have to open up roads and paths, sometimes clearing several hectares in the process. Today, some of these trees are on the Red List of Threatened Species (compiled by the International Union for Conservation of Nature) or the list of CITES­controlled species. But nevertheless, an ever-increasing demand promotes illegal trade, because the market is a lucrative one. One cubic meter of a particularly highly prized variety of rosewood can sell for up to 3,000 Euros in Asia. This trafficking is often undertaken in areas of political instability or governmental weakness, or in huge, sparsely populated regions that are difficult to monitor. The illegal timber passes from intermediary to intermediary, going from one end of the planet to the other: logs might be cut in Cameroon, processed in China and sold as a product, e.g. a table, in France. The problem may seem insignificant, but in the European Union, according to some estimates, more than 20 per cent of imported wood and forest products – the equivalent of over 360 million cubic meters – are probably illegal. While forests, which store large quantities of carbon dioxide, are an important ally in the fight against climate change, they have already begun to be affected by it. Some of the effects are positive: with shorter winters, trees grow for longer periods, and with more CO2 in the air they grow faster, because the gas increases photosynthesis. 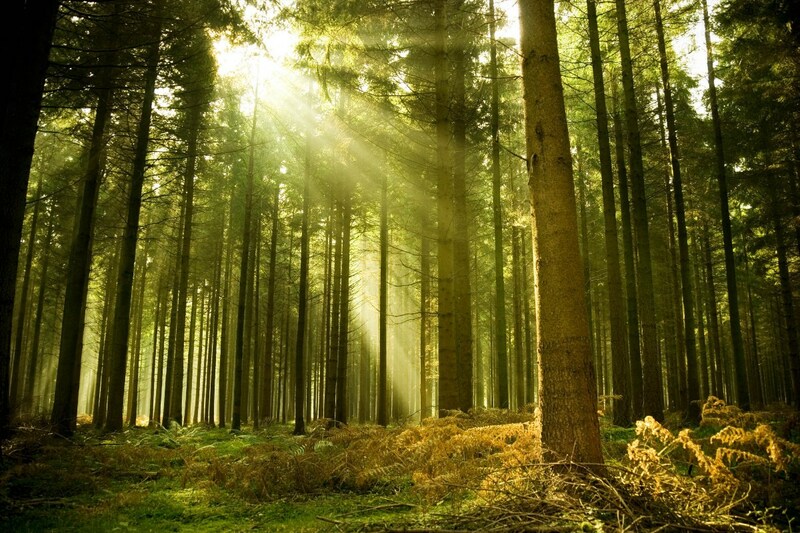 Since the early 20th century, forest productivity has grown by around 40 per cent in Europe. At the same time, the global warming makes forests more fragile. An illustration of this phenomenon is the ‘drunken forest’. In Siberia, rising temperatures have resulted in the thawing of permafrost (soil that is usually frozen year round). As the soil softens, the trees wind up tilting over, growing in unusual directions. Because they are less solidly anchored in the ground, they are prone to collapse at the least disturbance, like a house of cards. Acid rains, resulting from the air pollution, are also dangerous. They have caused irreversible damage to dozens of millions of hectares of the forests in Canada and Europe. Though this phenomenon is less common nowadays, the threat of acid rain persists in China, where numerous coal-fired power plants, which are major sulphur emitters, are in operation. Because forests can hide enemies, armies sometimes see the destruction of forests as an important strategy. Between 1962 and 1971, the US military sprayed approximately 80 million liters of defoliants (i.e. chemicals sprayed or dusted on plants to cause its leaves to fall), including the notorious Agent Orange, onto the Vietnamese countryside. One fifth of the forests in the south of the country were destroyed, and 36 per cent of the 291,000 hectares of mangrove forest were wiped out. Damaging the forests may be a side effect of the struggle against another evil, the drugs. In Columbia, for example, vast areas of Amazonian forests were regularly destroyed due to the fact that the country’s authorities actively used the herbicides, resulting in destruction of not only the drug plantations but also forests and agricultural crops. According to the Food and Agriculture Organization of the United Nations, the most endangered now are the mangrove forests. Their surface area diminished from 18.8 million hectares in 1980 to 15.2 million hectares in 2005 – a reduction of nearly 20% in a quarter of century. Mangrove forests are traditionally exploited for their wood, reputed as rot­ and insect resistant. But recently they have become victims of other modern threats such as farms, housing, aquaculture, port infrastructure and tourist resorts. However, there are several positive trends, indicating that the situation becomes more favorable for the forests. In this regard, the worldwide Billion Tree Campaign has become the most important event in the recent years. This campaign was initiated in November 2006 by prof. Wangari Maathai, a Nobel Prize Winner (2004), in cooperation with the UNEP, several non-government organizations and the UN bodies. The idea was to plan of 1 billion trees all over the world by 2007. But once this goal was achieved, the campaign’s founders have decided to develop their success. As a result, more than 11 billion trees have been planted by now and this number continues to grow. Anybody can take a part in the abovementioned campaign – a person, a group, a small company, a large corporation, city authorities, a ministry, government etc. Anyone can register at the campaign’s web site and make a contribution to the planet’s forest expansion, regardless the number of trees planted – one, dozen, thousand or million. In Peru, after the company’s goal to plant 170 million trees by the end of 2010 was achieved, the new campaign with the intention to plant 60 million more trees was launched almost immediately. The initiative here was taken by the Peruvian government in cooperation with the private sector through the AGRORURAL program. The country even managed to enter the Guinness Book of Records, when near the Tupac Amaru School, Tuman District in the north coast of Peru within the record-breaking short period of 5 minutes and 20 seconds were planted 27,166 trees.